The Carinish Inn on North Uist will be used by the Free Church. The keys to a former island pub are being handed over to the Free Church to begin the building's conversion into a place of worship. 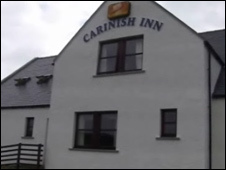 Regulars held a farewell party to the Carinish Inn on North Uist on the Western Isles at the weekend. The Free Church said the new role would see the building bring together about 60 members who presently worship at three churches. The move reverses a trend of old churches being converted into bars. Plans for turning pubs to use by churches are being pursued elsewhere in the UK. The phrase "last orders" could be given a new meaning if a church in Antrim, Northern Ireland, is successful in its attempt to purchase a nearby bar. The owner of Viscount O'Neill's pub in Church Street, Philip Ramsey, said he had received a bid of more than £600,000 from First Antrim Presbyterian Church for the premises. The church was keen to buy the bar with a view to turning the property into an "outreach facility". In the summer, customers at a Cornish pub enjoyed some prayer with their pints. Drinkers at the Seven Stars Inn, in St Austell, were offered the chance to take part in informal Sunday worship in the bar. The services are led by the Reverend Patrick Bamber, associate vicar of the town's Holy Trinity Church.